Our hearts are full, and our tails are wagging! More sick and injured children will soon have the comfort of a furry friend during visits to The Studer Family Children’s Hospital at Sacred Heart, thanks to a $100,300 grant from IMPACT 100 Pensacola Bay Area, Inc. 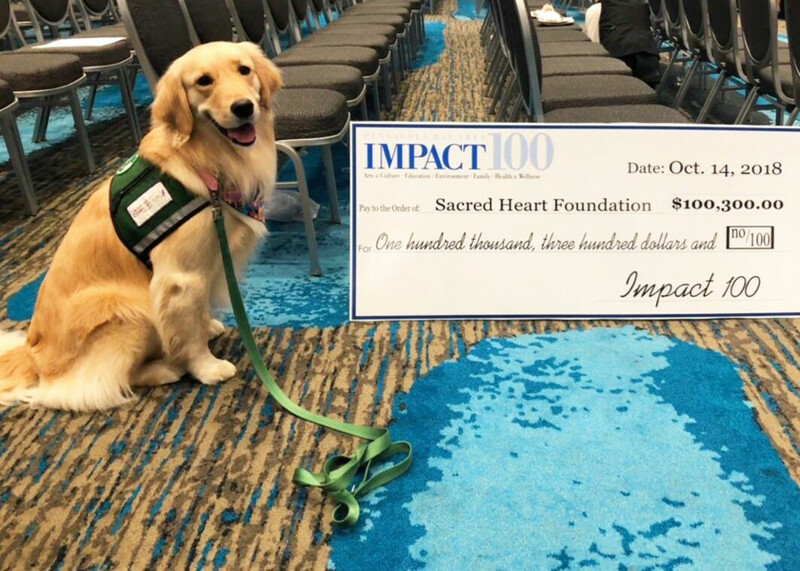 Following the success of the Children’s Hospital’s first facility dog — a two-year-old female golden retriever named Sprout — who arrived in November 2017, Sacred Heart was selected as one of this year’s IMPACT 100 recipients for its plan to add four new facility dogs to the Children’s Hospital. Sprout came to the Children’s Hospital from Canine Assistants, a nonprofit organization based in Milton, Georgia, that trains and provides service dogs for children and adults with physical disabilities or other special needs. The Children’s Hospital plans to work with Canine Assistants again in obtaining the next four facility dogs. Each facility dog will be accompanied by a handler who will receive specialized training through Canine Assistants. “Research has shown that dogs can reduce stress and help patients feel better both emotionally and physically,” said Julia Humphries, child life specialist and Sprout’s primary handler. Sprout currently serves patients and families in the Pediatric Infusion Center, in the outpatient pediatric hematology/oncology office and on the inpatient floors of the Children’s Hospital. The four new facility dogs will serve the Children’s Hospital’s Autism Center, pediatric rehabilitation office, inpatient units, radiology and diagnostic departments, as well as the medical-observation unit, which will open with the new four-story children’s hospital in spring 2019.